Volunteers in Pateros have organized a “Make a Difference Day” for October 25th and have invited volunteers to join them in making a difference for those affected by the fire. You can also contribute to response work in the PNW Conference by designating a gift as “Disaster Response” or “Advance #352″. The largest wildfire in Washington’s history roared through the North Central part of the state in mid July of 2014. By the time the fire was extinguished, it had burned roughly 210 square miles. 356 homes were destroyed. 270 of them were primary residences, 55% were uninsured. Countless out buildings, pieces of farm equipment, and infrastructure were reduced to ash or hunks of metal and miles of power lines were down. Hundreds of survivors were without a home, left with no place to go. That was roughly three months ago. Since then, progress has been made but it’s slow. FEMA rejected the application for Individual Assistance so recovery is up to the cities, the county, the State, and the generosity of the people of Washington. 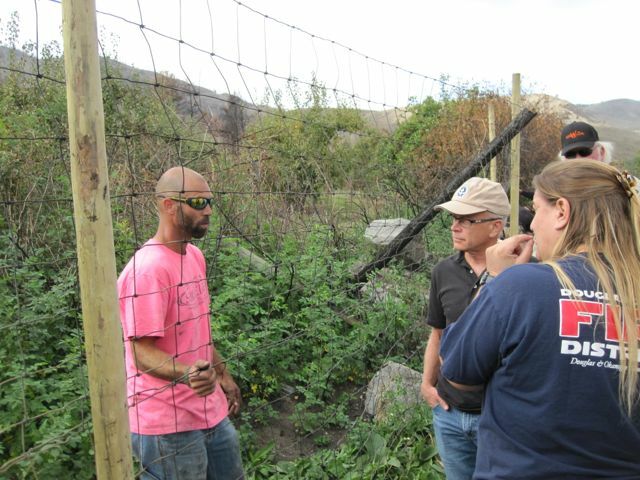 A volunteer team discusses the repair of deer fencing in preparation for the winter. get the hundreds of miles of deer fencing back up. Housing was in short supply before the fire and now it’s non-existent. The displaced families are staying with friends, living in tents or in camp trailers. The county and state are searching for alternative housing options. The metal clean up is well underway. Most of the burned sites in the town of Pateros have had the metal removed and the Mennonite Disaster Service (MDS) has agreed to tackle the remaining sites in the outlying area. Disposal of the ash and concrete rubble is a complex environmental problem that is hindering completion of this task. [pull_quote_right]Volunteers in Pateros have organized a “Make a Difference Day” for October 25th and have invited volunteers to join them in making a difference for those affected by the fire. [/pull_quote_right]There is a huge deer population in the Okanogan area (estimated at more than 25,000 mule deer plus white tailed deer). In the winter they migrate out of the higher elevations to forage on the Bitterbrush on the prairies. The orchardists protect their orchards by enclosing them with seven-foot high deer fences mounted on metal and wooden posts. The fire wiped out the deer’s food supply and burned the wooden posts supporting the fencing so the deer are feeding on the fruit trees. The deer migration has just begun. The orchardists must get the fences back up soon or the orchards will be decimated. Volunteers have been helping for about three weeks but, with hundreds of miles of fencing to be repaired, it’s a daunting task. Many more volunteers are needed if the orchards are to be saved. Volunteers in Pateros have organized a “Make a Difference Day” for October 25th and have invited volunteers to join them in making a difference for those affected by the fire. The priority for the 25th will be metal cleanup and deer fencing. If you’d like to help, contact Carlene Anders, skischool@ncidata.com or 509-733-0318. Ms. Anders stated they are also looking ahead to rebuilding the homes and repairing the infrastructure. Most of the rebuilding will have to wait until spring because it will soon be too cold and there will be too much snow for construction. This is where the United Methodist can really step up and support them. They are going to need many volunteers to help build the homes and they are definitely going to need our financial help. I encourage you to consider volunteering next spring and summer. Maybe even recruit a team to go help. You can help financially by making a donation to PNW Conference Disaster Response Fund, Advance #352. Your contribution will be used to help the survivors recover. If you have questions, you can contact me at umvimdisasterresponse@comcast.net or 253-630-1268.